This shortbread biscuit dough is pressed into bun or muffin tins, so there's no rolling out to make a pastry case. Alternatively, slice the dough and cook flat as biscuits. 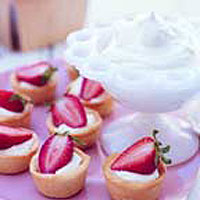 Fill the cases with lightly whipped whipping cream and half a strawberry. Preheat the oven to 180°C, gas mark 4. In a bowl, beat together the butter and sugar using an electric handwhisk for 2-3 minutes until pale and fluffy. Gradually beat in the egg, and then stir in the flour and almonds to form a rough dough. Turn out onto the work surface and knead lightly - the heat of your hands will help bring the mixture together to form a soft, pliable dough. Divide into 24 equal pieces, roll into balls then press into flat discs with your fingers and use to line 2 x 12-hole mini muffin trays. Bake for 15-20 minutes until golden. Allow to cool. The unfilled cases will keep in an airtight container for 3-4 days. You can also make 12 larger cases by baking the mixture in a 12-hole bun tray (bake for 20-25 minutes) or a combination of smaller and larger cases.